Some of Canada's youth have indifferent or racist attitudes about aboriginal people who attended residential schools, according to a documentary by two Yellowknife teenagers. Some of Canada's youth have indifferent or racist attitudes about aboriginal people who attended residential schools, according to a new documentary by two Yellowknife teenagers. 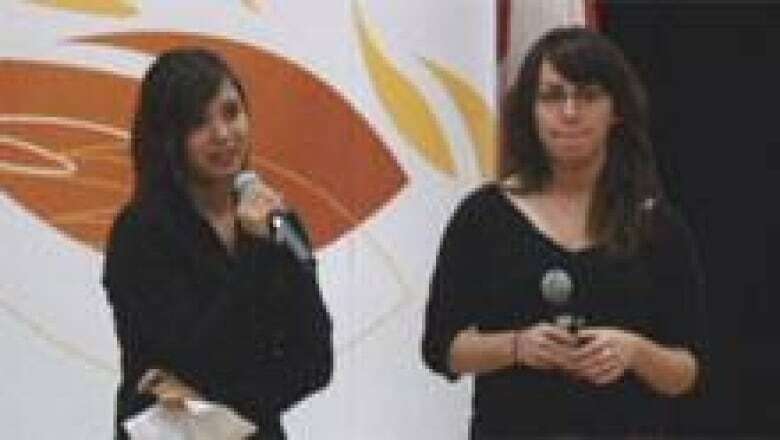 Marlisa Brown and Molly Tilden showed their documentary, in which they interviewed youth in Yellowknife, to former residential school students attending the Truth and Reconciliation Commission's national event in Inuvik, N.W.T., on Wednesday. Their film gave a candid look at what young people thought about aboriginal people who went to residential schools during the 20th century. "We were going around asking people if they wanted to be interviewed. When we said residential schools, tonnes of people said, 'What's that? I don't know anything about that,'" Tilden told CBC News on Wednesday. A total of about 150,000 First Nations, Métis and Inuit children across Canada were placed in more than 130 residential schools from the late 1870s until the last school closed in 1996. Most students were forbidden to speak their native languages or otherwise engage in their culture at the schools, which were run by churches and funded by the federal government. Some reported experiencing physical and sexual abuse. Many former residential school students, also known as survivors, who have shared their stories with the Truth and Reconciliation Commission said their experiences have had major and lasting — and often negative — impacts on their lives. But the hundreds of survivors and others who watched Tilden and Brown's documentary at Inuvik's Sir Alexander Mackenzie School heard one young man say, "I'm just not really interested in it" when asked about the residential school issue. Another boy told the filmmakers be believes the effects of the schools have made people "become alcoholics and drug users and they beat their children." "But the way I see it, they had a choice," the boy added. "They had a choice to consume that alcohol. They had a choice to smoke that drug." Another young man said residential school survivors "should just get over it" because they were recently compensated by the federal government for what they had gone through. Brown and Tilden said in the course of putting their documentary together, they discovered a lot of ignorance among younger generations. "They would say like that they didn't care, they didn't know anything, that the survivors should just move on … really harsh things like that," Tilden said. Brown, who is of Gwich'in heritage, said she has experienced some of that ignorance and racism first-hand. "Even though my friends are racist towards aboriginals, and I'm aboriginal, I got used to it as I grew up," Brown said. But Barney Williams, the official elder of the commission's Inuvik event, credited the young people in the documentary with being honest about what they thought. "They were to the point, and I really believe we need to hear that, and we being the survivors," Williams said. "Yeah, it maybe offended some people. However, I think from that we can move on … every speaker has said we need to move on." Tilden and Brown said if young people better understood what residential school survivors have gone through — in part by hearing survivors' first-hand accounts — they may have different opinions. The Truth and Reconciliation Commission was formed by the federal government in 2008, around the same time the a formal apology was issued in the House of Commons for the abuses people suffered at residential schools. The commission is hosting the Inuvik event — the second of seven national events to be held across Canada — to allow former students, staff and others whose lives have been affected by residential schools to talk about their experiences. The national event, which began Tuesday and runs through Friday, also aims to educate the public about the residential school system and its effects. The teens' documentary will eventually be included in the commission's archives, along with testimony from survivors and others. Truth and Reconciliation event starts in N.W.T.